There's something to be said for the usefulness of paper organisers. While I love online planning as much as the next person, it really helps sometimes just to have all the details for my upcoming DIYs in one spot rather than having a pin for the instructions in Pinterest, a link to the supplies in Safari, sketches in my notepad... the list goes on. So I thought I'd make up a printable organiser for all you DIY enthusiasts out there - this way, you can gather the info for your rad projects in one place! The instructions for this one are simple as pie - download the printable project planner file, print it out onto letter-sized paper and fill in the blanks! There are spots in the printable for your project instructions, budget, completion date and sketches. Plus there's a separate sheet for you to list all the supplies you need, the quantities of each that you'll require, the stores you'll have to visit and how much the materials will cost. 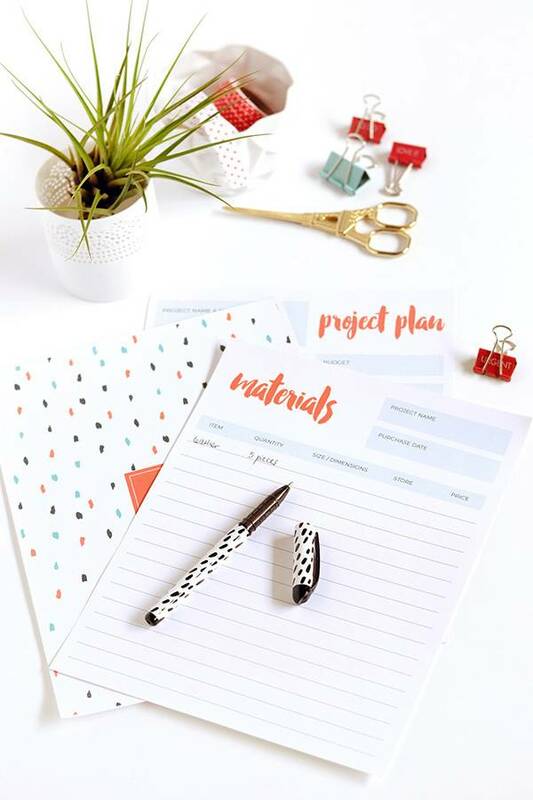 There's also a 'Make It' cover to tie everything together - simply print out lots of the 'materials' and 'project plan' sheets and staple them together with the cover on top for an instant Project Organiser booklet! (or if you like, you can store the sheets in a binder - just make sure you get one of those binders where you can insert a cover sheet in the front). I love this one, Stephanie. And I'll definitely be using this on my next project. Brilliant!